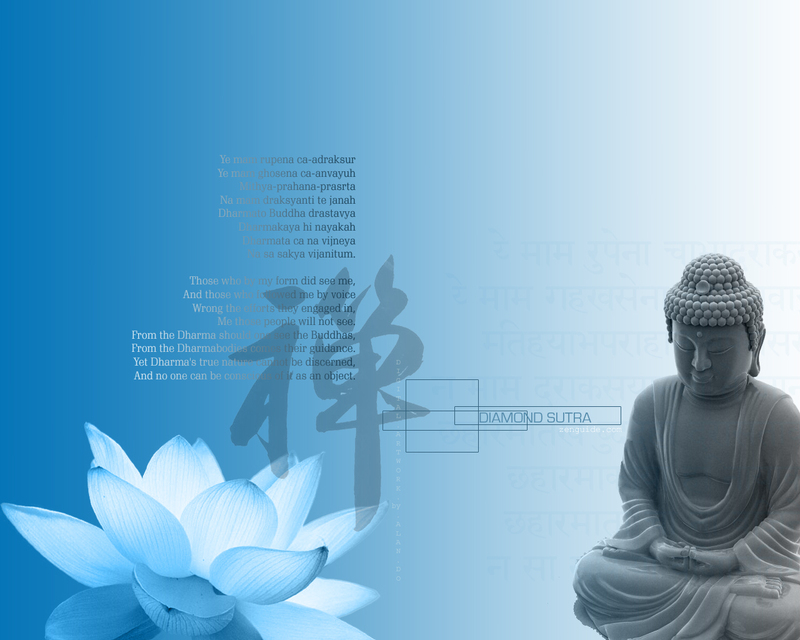 So we have here a bluish background wallpaper, with a Statue of the Buddha, and a Lotus. Lotuses have unique names in Sanskrit, based on their color. A blue lotus, that we have in the wallpaper is specifically called as a “ Utpala – उत्पल ” in Sanskrit. 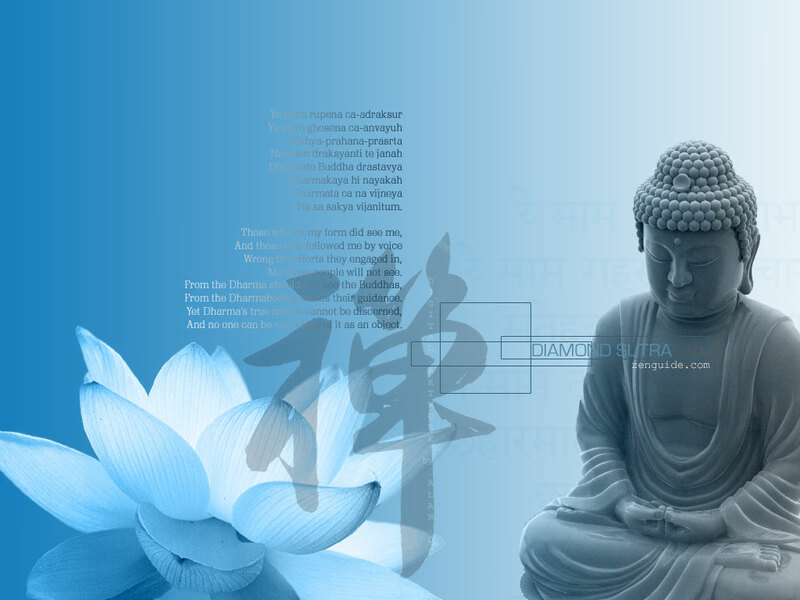 The quote given in the wallpaper is from the Diamond Sutra, whose proper title is “वज्रच्छेदिका प्रज्ञापारमिता सूत्रम् – vajracchedikā prajñāpāramitā sūtram” . Fully translated into English as the “Diamond Cutter Perfection of Wisdom Sutra”. Since people like to abbreviate things, it has become popularly known as “Diamond Sutra”. [The Lord Spoke: ] “Subhüti, what do you think about this? Is one to be viewed as the Tathägata due to perfect marks?” Subhüti replied, “Bhagavän, it is not so; one is not viewed as the Tathägata due to perfect marks.” The Bhagavän said, “Subhüti, it is so; it is so. One is not viewed as the Tathägata due to perfect marks. The Buddha said, “Subhuti, if one could contemplate the Tathàgata by means of the thirty- two marks, then a Sagely Wheel- turning King would be a Tathàgata. Subhuti said to the Buddha, “World Honored One, as I understand what the Buddha has said, one should not contemplate the Tathàgata by means of the thirty- two marks. ~ by Vinodh on June 24, 2009. Well said that for the point of practice, the two interpretations carry essentially the same meaning. ince there was no written language during the time of the Buddha the original Pali text was written nearly 300 years following the death of the Buddha. The oral tradition was maintained in its original context during that time but there are still many debates regarding the pure translation of the old text. The Sanskrit text came into existence some time after and both have been translated many times with different translations. Thankfully, the intent has remained fairly intact regardless of translation as you point out here. I do not know really anything about Buddhism but was in meditation when the Lotus appeared with a diamond above it. So I typed this in Buddha, lotus and diamond and here we are. So what am I supposed to do now with this image? It is all so much to learn- are there good and fast intro to Buddha images or something I can consult. Do I start chanting something? It is quite Auspicious that you saw this imagery. Please register at http://www.lioncity.net/buddhism – E-Sangha Buddhist Forum and post your query there. People will guide you better in there.